“Traditional Sami food and the Sami way of cooking is my passion and I want to keep that knowledge alive.” Herbs, fish and reindeer provide Ingrid with both food and material for her traditional handcraft- duoddji. She is a skilful cook and craftsman and the meat she cooks comes from her own herds. What she cannot provide herself comes from local or organic producers. 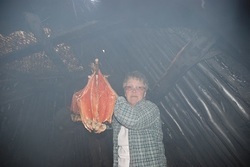 Ingrid was one of the food creator in the book "Taste of Sápmi"
Per Nils Pilto has been a reindeer herder all his life. He knows from his own experience how it is to live and work in the mountains and can tell about everyday Sami life, how it is and how it was in the past. 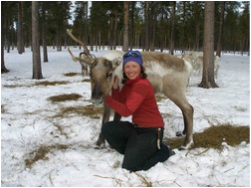 ​Annna-Marja Kaddik has her own reindeer herd and works in the Gran Sami district herding and tourism. She was one of the managers of the book "Taste of Sápmi" which got one of the prices in China 2015 "Gourmand world cookbook awards"
Sami food and hiking in a magnificent scenery adds something more to the experience .As you walk along reindeer trails you stop to rest by a fire and drink some water from a mountain creek and feel rested and at ease. Åse guides you through the changing scenery and shows you how to manage in the mountains. She has a good knowledge of modern and traditional reindeer husbandry and can tell you about flora and fauna from a Sami perspective. She is a trained guide and a member of Guides without Borders. Marja Skum works part time as a Sami teacher in Kautekeino in northern Norway. She helps out with herding reindeer at home in Ammarnäs. Marja is a skilful craftsman and guides tourists in her home area.